One of the highlights of every holiday season is the release of new films – how many of this year’s crop have you seen? Studios release their biggest and most important films at year’s end not only to draw huge audiences, but also to get the attention of the major awards competitions. Of course the granddaddy of all movie prizes is the Oscar ©, given by the Academy of Motion Picture Arts & Sciences. Did you know that Oscar and Ohioana share the same birth year? The first Academy Awards © were presented at the Roosevelt Hotel in Hollywood on May 16, 1929 – less than five months before Ohio First Lady Martha Kinney Cooper gathered a committee of volunteers at the Governor’s Residence in Columbus to establish a special library dedicated to collecting, preserving, and celebrating Ohio literature and other creative endeavors. In our parallel trajectory, many Ohioans have been the recipients of the Oscar, including Clark Gable, George Chakiris, Eileen Heckart, and Paul Newman. Halle Berry made history in 2002 as the first (and thus far only) African American winner of the Best Actress award. Composer Henry Mancini is our state’s all-time winner at the Oscars, receiving four statuettes for his music, including the Best Song of 1961, “Moon River,” one of the classics of the American popular songbook. An Oscar winner whose name you might not be as familiar with is author and screenwriter Donald Ogden Stewart. Stewart was born in Columbus on November 30, 1894 (just twelve days before and two miles away from other future celebrated writer – James Thurber). After graduating from Yale and serving in the Navy in World War I, Stewart settled in New York and began to write. His quick wit soon led him to becoming a member of the Algonquin Round Table, the celebrated literary circle that also included Dorothy Parker, Robert Benchley, and Ernest Hemingway. Stewart turned to writing plays, and success on Broadway led him eventually to Hollywood. Among his notable screenplays in the 1930s were The Barretts of Wimpole Street, Marie Antoinette, Holiday, and the 1939 classic, Love Affair (remade in 1957 as An Affair to Remember). In 1940, M-G-M hired Stewart to adapt Phillip Barry’s play The Philadelphia Story for George Cukor’s film version starring Katharine Hepburn, Cary Grant, and James Stewart (who was no relation). 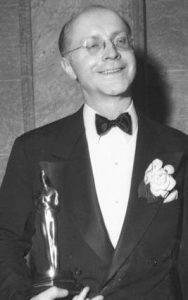 The film was a critical and popular smash, and earned six Oscar nominations, including the two Stewarts, both of whom won – James Stewart for Best Actor and Donald Ogden Stewart for Best Adapted Screenplay. The host at that year’s awards ceremony was comedian Bob Hope (another Ohioan, from Cleveland). Hope would later recall it as “one of those bathos-drenched evenings where winners thanked everyone from their producer, director, and co-stars down to the ‘little people’ – by which I assumed they meant pygmies, dwarves, and elves.” Then Donald Ogden Stewart’s name was called. The audience broke up in laughter and gave Stewart a huge ovation. Hope would remember it as one of the favorite moments of his record-breaking nineteen times as the awards host. Stewart continued writing screenplays throughout the 1940s, working with top-flight directors such as Cukor and Michael Curtiz, and stars such as Hepburn, Spencer Tracy, William Powell, and Lana Turner. Then came the second “Red Scare” of the early 1950s. Stewart, who had been actively involved in the Hollywood Anti-Nazi League during World War II, admitted that at one time he had belonged to the Communist Party. Blacklisted by Hollywood studios, Stewart and his wife moved in 1951 to England, where he remained until his death in 1980 at the age of 85. So as this movie-laden holiday season takes us into a new year, and as Hollywood prepares for the 90th anniversary Oscar ceremony on March 4 – Ohioana raises its glass to Donald Ogden Stewart. And Happy 2018 to you!